I simply cannot take any credit for this dish with the exception of the photo above. My friend Jessica came over last week to the Thanksgiving Potluck Party & Playdate I hosted. Jessica has a great blog, The Jey of Cooking, and I knew that whatever she brought would be darn good. She made these stuffin' muffins and they were a hit! I loved the small portions, making it easy to serve. The kids loved how portable they were and of course, they have the perfect balance of sweet and savory, as well as a nice mix of soft and crunchy textures. Yes... these are gluten laden. No... I didn't care that I probably shouldn't have had one (or two). 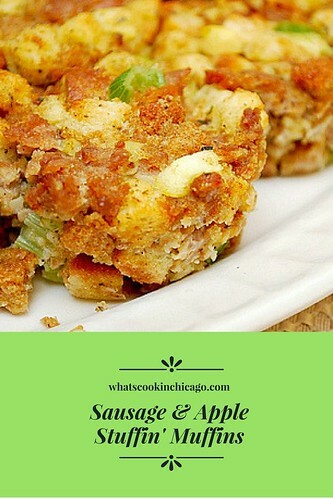 But these were great and I think I'm going to find a way to make them with gluten free bread or croutons for next week! Preheat the oven to 350 degrees. Grease a 12 cup standard muffin tin. In a medium skillet, crumble in the sausage and brown thoroughly. Remove sausage from the skillet with a slotted spoon and set aside on paper towels. In the same skillet, melt the butter. Add the apples, celery and sage; saute for about 4 minutes. Add the cream soup, stirring to combine and cook for 2 more minutes. 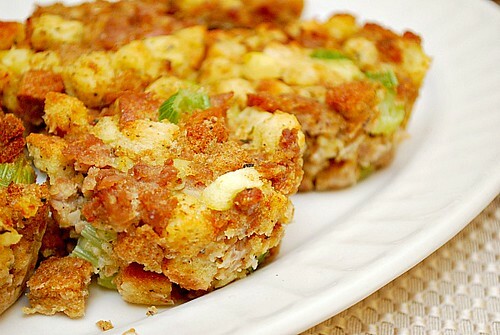 Place the stuffing in a large bowl. Add the browned sausage and apple cream soup mixture. Add 2 eggs to the bowl and using your hands, combine well until fully incorporated. Add broth until the bread is moistened and you are able to form a ball with the stuffing. Firmly press the stuffing into the prepared muffin tin. Bake in the preheated oven for 15-20 minutes until set. To serve, remove from muffin pan and garnish with a parsley leaf.